Reconstruction is incomplete for those melodies marked with a *. Gui Qu Lai Ci (Come Away Home, 1511); Tao Yuanming's influential poem on the virtues of being a "home recluse"
These need not specifically mention the Dao. Thus Water Immortals Melody (above) concerns learning from nature, and learning music from nature is very much a Daoist concept. Since Chinese is written in ideograms, not an alphabet, it is difficult to know what the original pronunciation would have been for "道". Regarding the modern choice of "dao" vs "tao", the former is the common mainland Romanization system, the latter was the Wade=Gile version. In English the difference between "d" and "t" is usually that the former is both aspirated and voiced while the latter is usually aspirated but unvoiced. In modern Chinese both sounds are unvoiced, the difference being that the "d" is unaspirated while the "t" is aspirated. The old Wade-Giles system distinguished this difference by writing the unaspirated sound as "t" and the aspirated sound as "t'". Also: 莊周 Zhuang Zhou; see separate entry. Also: 老聃 Lao Dan; see separate entry. Although one might argue that all qin music could in some way be ritualistic (hence stories such this one from the Shi Ji saying that by playing the qin Shun brought order to the universe), this concept is as much Confucian as Daoist. It is also presumably this aspect of the qin that led it to be included in ritual orchestras even though it could not be heard (where orchestras included 10 or more qin, even then they would not have been heard in the large court environment required by the orchestra, unless there were specific solo parts for qin, which even if done was apparently never documented). "A kind of recital that is spoken in a voice specially pitched low or high, resembling the speech used in Chinese opera"
Arguably the most specifically Daoist ritual music for qin would be qin songs with Daoist texts, the first category included above. Here one finds settings of two texts, the first of which is known to have been chanted, the second of which would have been chanted in a similar way (as yet I have found no specific reference for this). The qin settings for these two pieces put the melodies either in the first category, or take them out of this categorization completely and into a more specifically musical context (where the text is not necessarily song at all). 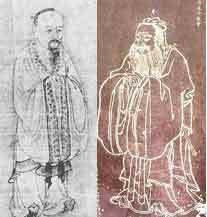 At present it does not seem possible to say whether in the oral tradition any Daoist practicioners used the qin for private rituals, and if so how; on the other hand, it seems perfectly plausible that they would have done so, and that this may occur again. As for the specific songs such as those in the first category above, one can approach them in several ways: learn to play and sing them, learn to play or sing them, listen to the music separate from the text, listen to the singing separate from the music (whether it be qin or other instruments), or listen to them as independent melodies (as is generally done today with Pu'an Zhou: most people who hear it, or even who play it, are not aware of its origins as a chant).